Any given week, we might hear from a family in Hancock County who has an immediate need of a simple-decent place to live. We hope to be able to better address that need by building multiple homes each year, but at present we are only able to build one home a year or every two years. We have qualified and selected our 19th Partner Family, and look forward to seeing you on site! Please consider partnering with us on this project through a donation of in-kind goods or materials. For a list of how we promote our partners, including at our ReStore which has annual foot traffic of over 8,000, please click here. 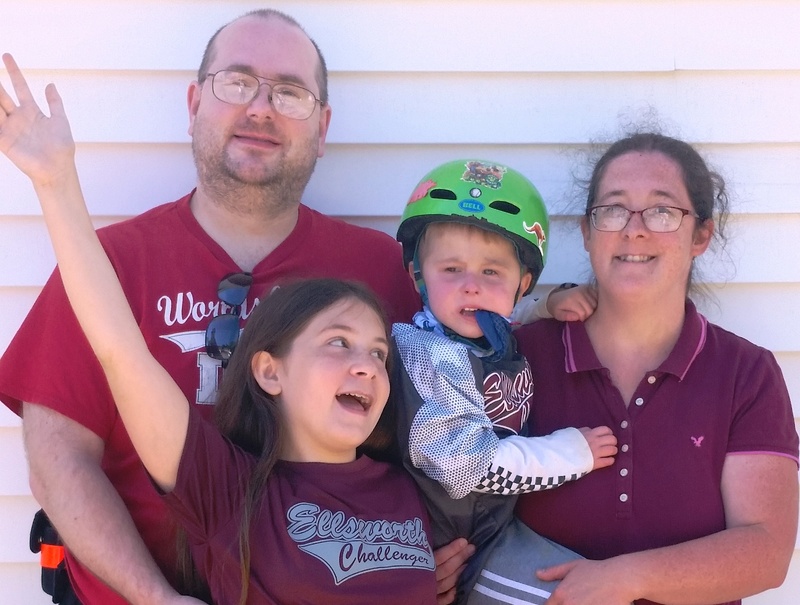 We are so pleased and excited to introduce you to the Campbell family — Derek & Kylie, Samantha (almost 12) and Thomas (5) — our new partners selected for the Franklin build. We look forward to sharing their story with you soon. WE’RE LOOKING FOR VOLUNTEERS to work with us on Fridays and Saturdays on our current build in Franklin. Please email Director.HCHH@gmail.com if you’re interested in coming out as an individual or group. Also, we’re looking to develop a group of volunteer “regulars”–those who’d like to volunteer 2 or more Fridays a month on a regular basis. Typical work days are from 9:30AM to 3PM. In order to be sure that we have enough materials and tasks, we ask that you R.S.V.P. and receive a confirmation before coming out. Please enjoy the photo collage shown above which features initial site progress pictures (more on Facebook–now at the framing stage) as well as some from MDI HS. Sailor and boat builder, Steve Keblinsky (pictured sitting at the picnic table), who joined the MDI staff to teach a marine service technology course, also co-taught this year’s Habitat course with Wilton Jones at the school. HFHI SAFETY TRAINING: While we were waiting for our current build to gear-up, staff have been focusing on safety and continuing education work. Our affiliate recently organized and attended a Competent Person Safety Training [CPST] down at the Portland Habitat affiliate. The CPST initiative was developed by Habitat International in late 2013 and is lead by specially trained Habitat RV Care-A-Vanners–providing in-depth safety training for individuals designated as the affiliate’s “Competent Person” as defined by the Federal Occupational Safety and Health Administration (OSHA). Two staffers attended the multi-day training which covered the topics of stairways, ladders, scaffolds, electrical, trenching/excavation, and fall protection. MANUALS: We’re also editing a copy of construction & safety manuals from a large affiliate located in the Midwest/Great Lakes region for use with our area affiliate–both of which will be published at a later date as reference material online on our website with “quick start” guides to be featured from time-to-time on certain topics in these periodic updates. We’d suggest taking the Volunteering On A Habitat for Humanity Job Site course as well as Fall Safety, Ladder Safety, Portable Power Tool Safety, Preventing Slips Trips and Falls, and Scaffolds – Construction courses–all listed under “Recommended Courses”. Many courses are offered in both English and Spanish. …And consider letting us know that you’ve completed a course (optional quiz at the end to earn a certificate) by entering your contact info. (name and email) and selecting “volunteer”, “Maine”, and “Hancock County Habitat for Humanity” at the end of the quiz. This construction volunteer skills & interests survey does include a section where you can list your interest in participation through my personal favorite: hospitality–aka “baked goods” …Yes, truly, you don’t have to lift a hammer to help! While no specific skills are required, just a willingness to learn, it’s sometimes helpful to know who we might call upon for specific tasks, to assist with supervising and/or teaching larger groups, or for hospitality. Hancock Co. Habitat provides a crew leader who will provide on-the-job training. We welcome skilled volunteers and want to encourage those in the building trades to join us on site, but the majority of our volunteers who join us have few construction skills. Volunteers often remain with their local Habitat affiliate on a long-term basis and volunteer regularly in order to build skills. We will train you in all aspects of construction with the hope that you will continue to volunteer, and even perhaps share your skills with unskilled volunteers in the future. Thank you for your service!